The FASGW / ANL anti-ship missile is being developed by MBDA, for the French and UK Royal navies. © MBDA UK 2014. 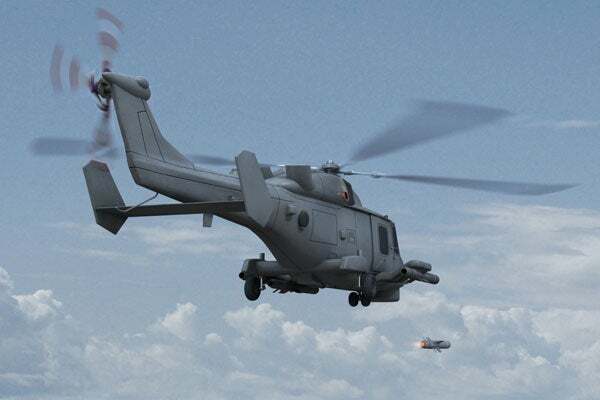 The FASGW / ANL missile will be integrated with the Royal Navy's AW159 Lynx Wildcat maritime surveillance and attack helicopter. © MBDA UK 2014. The FASGW / ANL missile can travel at high subsonic speeds. © MBDA UK 2014. The FASGW / ANL missile will weigh 110kg. Image courtesy of Tiraden. Future Anti-Surface Guided Weapon (Heavy) / Anti-Navire Léger (FASGW (H) / ANL) is an anti-ship missile being designed and developed by MBDA, for the French and UK Royal navies. The missile is expected to enter into service in 2015. The helicopter-launched missile will be designated as FASGW (H) by the Royal Navy and as ANL by the French Navy. It will be deployed to engage maritime and land targets. The missile will replace MBDA’s anti-ship missiles including Sea Skua and AS15TT and will be able to move at high subsonic speeds. The over-the-horizon missile will have a length of 2.5m and a diameter of 200mm, and will weigh 110kg. It will offer protection for the launch helicopter from air defence systems. The new design of the missile will enable the existing users to easily modernise the Sea Skua and AS15TT missiles. "The new design of the missile will enable the existing users to easily modernise the Sea Skua and AS15TT missiles." The governments of UK and France announced the joint FASGW / ANL project at the Franco-British Summit in March 2008. The authorities signed a formal Statement of Intent in January 2009 and the two countries executed a contract with the missile developer and manufacturer MBDA for the joint assessment phase of the Anglo-French missile programme in July 2009. The evaluation study phase of the missile was launched during the Lancaster House summit in 2010. MBDA completed the system design and the development of the technical maturity data of FASGW / ANL’s sub-systems in September 2011. MBDA conducted high speed wind tunnel trials, gas gun firings and motor firings, and also performed sea trials of data link and antenna under a variety of sea-state and weather effects. The missile’s IR seeker and radio-altimeter were also tested at sea or in simulation. MBDA secured a Demonstration and Manufacture contract worth $831m from the UK DE&S (Defence Equipment & Support) on behalf of the French Ministry of Defence (MOD) and UK MOD in March 2014. The contract will be managed under the company’s Team Complex Weapons Portfolio. The FASGW / ANL missile is intended to be integrated with the Royal Navy’s AW159 Lynx Wildcat maritime surveillance and attack helicopter. It will also be integrated with the French Navy’s Panther multi-role naval helicopter in a similar time frame and the NH90 multi-role helicopter in a longer time frame. "The missile will feature fire-and-forget capability and will be able to select precise target aim point." The missile will feature fire-and-forget capability and will be able to select precise target aim point. Its long stand-off range will allow the launch helicopter to remain safely outside hostile air defence systems. The missile will have an effective firing range against several surface targets including coastal suppression. It will also have effective strike capability against defended targets to reduce detection and the potential effectiveness of countermeasures. The anti-ship missile will also be capable of defeating emerging fast attack craft (FAC) and fast inshore attack craft (FIAC) ranging from 50t to 500t, traditional corvette, and static coastal and land targets. The precision aim point selection capability will enable the missile to destroy and immobilise larger craft. The FASGW / ANL missile will be equipped with imaging infrared (IR) guidance to provide positive identification of targets. It will also be fitted with a two-way data link terminal to transmit target data from an IR seeker to the operator. It will support change in the flight path during the mission. The missile will also be equipped with a radio-altimeter. The legacy onboard sensors will provide precision strike capability to the missile in any light conditions.